Kenmore model 40412 High-Efficiency Washr 3.1 cu. ft. I am extremely happy with the Kenmore 40412 front-loading washer because while it is not the biggest we could have got it definitely had the most features and is extremely easy to use. I got it for $450 which was an incredible deal looking at the prices of all the other front-loading washers. Not only did the price tag save me money but I learned that this washer is smaller than most washers which would give me a 45% energy savings which is awesome especially since I live in the city where my energy bill can get quite high. It also uses 35% less water so thing just keep getting better. The only thing that might bug people about this front-load washer is that the controls aren't very high tech and are pretty bland. Believe it or not that can be a good thing, while all the nifty bells and whistles are great, they have more components which dramatically add to price as well as the need for repairs, so the mechanical turn knobs are great. The washer has most of the wash cycles you could think of: normal, heavy, delicate, permanent press, and express wash, but it doesn't have some cycles that I was bummed about like pre-soak or delay wash settings. All in all this is a great washer and quite simple. It has been great to me and so far I have had no problems... albeit I have owned it 2 months, but still it is great for your energy/water bill and is financially friendly which is great in these tough times. 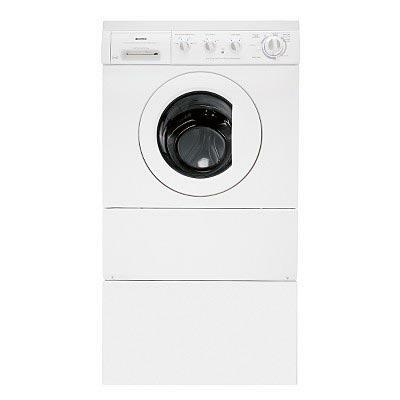 So if your into saving money and using less energy this is definitely the washer for you.